Claiming that his company's original name no longer reflects the products it offers, Apple chief executive Steve Jobs on Tuesday announced that Apple Computer would be renamed Apple, Inc., and revealed new product branding to match. In his opening keynote address at Macworld San Francisco, Jobs explained that the addition of Apple TV and iPhone to Apple's product range means that only one of the company's four product lines, the Mac, now represents what many would consider a true computer. The Apple cofounder argued that traditional computing was now just a part of his firm's overall business strategy, which now focuses heavily on handheld devices and those built for the living room. "We've thought about this... and we thought maybe our name should reflect this a little bit more than it does," Jobs said of the change. In addition, Jobs said Apple has begun altering its product branding to emphasize origin of its electronics devices. Conspicuously, the company has rebadged its media streaming hub (once codenamed iTV) as the Apple TV, substituting its distinctive corporate logo in place of the written 'Apple' title on the product itself, the packaging, and its official website. 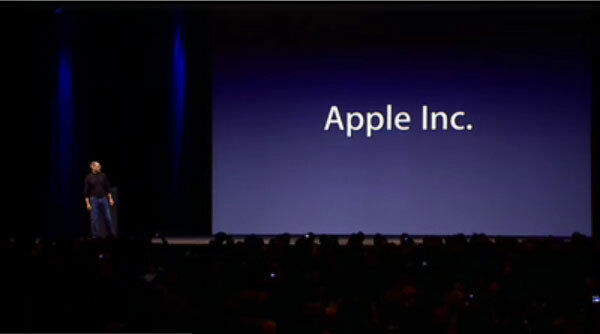 Apple chief executive Steve Jobs announces Apple Computer, Inc. is to be known hereafter as Apple, Inc. . The iPhone has received near-identical treatment as part of its introduction and sees its name prefaced by the Apple logo at its own product page. Neither iPod nor Mac hardware has yet to undergo such extensive rebranding, though boxes for the second generation versions of the iPod nano and shuffle now feature a prominent logo immediately preceding their respective names.